Venice was the center of fashion for the courts of Europe in the middle ages. Not only did Venice supply silks, satins and laces together with many other luxury articles, but it also decreed their mode of use. France and England were the largest markets. Catherine de Medici took with her to France collars of rich point lace. Their popularity was immediate. There is little doubt that to Venice belongs the honour of introducing the invention of needle-made laces into Europe, and it is likely that the Italians learned the rudiments of the art from the Saracens who had settled in Sicily. At the coronation of Richard III., in England, "fringe of Venice and mantle laces of white silk and Venice gold " appear; and later Elizabeth of York pays sundry sums of money for " gold of Venice, and other necessaries." worked on a parchment pattern without mesh net-work ground, the sections of the design connected by bridges or bars. VENETIAN NEEDLEPOINT AND BURANO LACE. ACCORDING to Molmenti, lace-making was always at Venice a private enterprise, unlike the great State-protected industries, such as the glass manufactures at Murano. A great quantity of cutwork was made in the houses of the nobility for their own use, and in the convents. Viena Vendramin Nani, to whom Vecellio dedicated his book in 1591, was accustomed to make lace, and to employ the young women of her household in this "virtuous exercise." Cutwork, as in France and England, was originally " greatly accepted of by ladies and gentlemen," and " consequently of the common people." The art spread downwards . Geometrical-patterned lace continued to be freely made for ornamenting linen for household purposes until the eighteenth century, but in the " La Vie Privee a Venise." The " Corona delle nobili et virtuose donne" (1592). 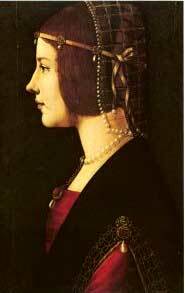 I Morosini Grimani, wife of the Doge Marino Grimani, set up at her own expense a workshop, in which were employed 130 workwomen under the direction of a mistra (maestra), Cattarina Gardin, who worked exclusively for the Dogaressa. In the last years of the sixteenth curved forms were introduced, and a new type of lace developed. In the early seventeenth century floral and human forms were often treated. The specimens with figures and animals are curious rather than beautiful. A type of lace of scroll design in flat needlepoint, recalling by its lightness very fine metal work or the arabesques of Persian ornament, is very interesting and well designed. In this type is a rosette-like or many-lobed flower, and the interlacing ribbon-like scrolls which show the influence of Oriental art. The solid part of the pattern is, in many cases, outlined by a slightly raised rib or edge, which also models portions of the ornament. The edge is also enriched by short picots, and the design is frequently united by short brides, either ornamented or varied by a single picot. There is no distinguishing name for this rare and beautiful type of lace. It is, strictly speaking, lace punto in aria, but the needle-point laces which were produced in the seventeenth and eighteenth centuries were virtually all comprised under the general name of punto in aria, for in 1616, 1633, and 1634, the Proveditori alle Pompe forbade the wearing of " punto in aere da Venezia," under penalty of a fine of two hundred ducats for each offence. The term is an unfortunate one, as it was also applied to a stitch in embroidery, " the high raised stitch," and continued to be applied to every kind of Venetian needlepoint lace, Marini quotes from a document of the seventeenth century, in which punti in aria appears to have been an alternative name for Burano lace. Rose point differs from punto in aria in three important details: in the highly conventional character of its design, its relief, and the elaboration of its brides. The design of the heavier rose points is almost invariably a foliated scroll, with an ornamental flower based upon the pomegranate, but much conventionalised. A natural pome¬granate appears in many specimens of late punto in aria, but the fruit, as it appears in rose point, is hardly recognisable. This conventional treatment of natural forms is a prominent feature of Italian design, as compared with the more naturalistic art of France, Flanders, and England. 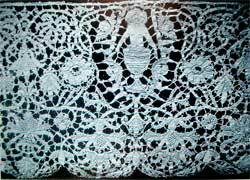 Figures and natural objects are rarely introduced even in ecclesiastical lace. A specimen of rose point, however, illustrated in Elise Ricci's " Antiche trine Italiane," shows a ship in sail containing three figures; and in a piece belonging to Mrs John Hungerford Pollen is represented the Madonna crowned and seated on clouds, with her foot on the neck of a cherub, and attired in a robe sprinkled with stars. Above are the Three Persons of the Trinity. Part of the robes are worked in open stitch, small black beads are added to the eyes. Mr Samuel Chick, again, has an altar border, the central portion of which contains emblems of the Passion. In the middle is our Lord's face upon a cushion wearing the crown of thorns, and surmounted by a halo ; underneath are the dice, pincers, flagellum, and hammer, to the right the flogging-post and ladder, to the left the cross, spear, and sponge on a reed. At the top are the crown of thorns and nails. 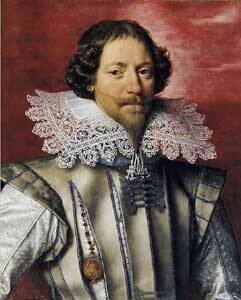 This piece was at one time the property of Mary of Orleans, Queen of Saxony, grand-daughter of Charles I. of England. In one unique collar mythological subjects are either outlined by pin-holes or distinguished from the background by a closer stitch upon the flat toile in irregular-shaped compartments. In a triangular piece in the possession of Mr Sydney Vacher stags and other conventionalised animals are introduced. Such specimens, however, were no doubt experimental in design, and are not often met with. The second point in which rose point differs from punto in aria is in its relief. In rose point, besides the raised edge which it has in common with some specimens of flat Venetian, higher relief is given by laying down a pad of coarse threads, varying according to the amount of relief it was desired to obtain, and covering this layer of thread by close button-hole stitches. This thick sheaf of threads takes naturally an unbroken curve, and to this may be attributed the almost invariably rounded and lobed forms of the ornament. This pad is often ornamented with a close fringe of picots, or by an ornament of free loops tier upon tier—ornamented with picots. No open spaces or jours are introduced into the toile, which is of an even and close button-hole stitch, varied by very small pin¬holes arranged in lines or veins, or in simple chequer, chevron, or diamond diaper patterns, subordinated to the general effect of the design. In a specimen in the possession of Mr Sydney Vacher the pin-holes form a date. The design is connected by a groundwork of brides, which have been already noticed in flat Venetian. The brides, simple in the heavy points, become highly ornamented in the finest specimens, and in point de neige are ornamented not only with picots, but with picoted circles and semicircles, and S-shapes, and star devices. Sometimes the brides are single—sometimes two or three meet together. In some specimens of rose point, however, the pattern is not strengthened on the edge by outer cordonnets of button-hole stitched work. In three square inches of a very fine specimen of rose point the following varieties of brides are to be found . The foot of this bride Occasionally there is a ground of cross-barring or trellis-pattern, the effect of which is a very open square mesh, orna¬mented at the points of section and in the centre of each side with an ornamented device or loop. In certain late specimens the brides form a slightly irregular hexagonal mesh, richly picote. This mesh is never, as in Argentan, a perfect hexagon, but is richer in effect, owing to this slight irregu¬larity and to the enrichment of the picots, than the plain Argentan mesh. The raised points are divided into gros point de Venise, punto neve (point de neige) with its ground of ornamented starred brides resembling snowflakes, and coraline point. Gros point de Venise, which was elaborated from 1620-50, and which was designed to lie flat and ungathered, is distinguished by the continuity of its designs, which are mostly horizontal; its scrolls are heavier than in point de neige, the brides simpler and less ornamental, the border or edge is usually straight—a single line of button-hole stitched thread enriched here and there with semicircles picote. In point de neige, which was to hang fully or to be gathered, and which was in vogue from circa 1650-1720, the style is modified ; the designs are composed on a smaller scale, and the groundwork of brides becomes a more im¬portant element, the scrolls are no longer continuous ; detached sprays, consisting of slender leaves and minute renderings of the flowers of gros point, covered with a profusion of flying loops which almost hide the form it enriches, spring from a vase-like ornament and are arranged in many specimens symmetrically on either side of a vertical line. This change was probably owing to French influence. is also ornamented with a small circle picote. Coraline point is a very attenuated variety of rose point in which relief is almost entirely absent, the leaves of the scroll have entirely disappeared, leaving a winding tangle of narrow coral-like ramifications ending in a small unimportant flower. The ground is of brides picotees arranged in hexagonal meshes. Point plat de Venise is similar in design to rose point, but, as its name implies, is entirely without relief. The diaper and chequer pin-hole patterns are more freely used than in rose point, but the general appearance is that of unfinished rose point. It is to be borne in mind that much of this lace was the produce of private individuals, or of convents outside Italy, and similar designs were often interchanged ; but with the exception of such private or conventual manufactures of lace, it is highly improbable that point d'Espagne or Spanish joint, a term applied to a heavier make of Venetian rose joint, was ever made in Spain. The heavy and valuable point laces which unexpectedly came out of Spain after the dissolution of the monasteries in 1830, were in no way distinguishable from similar pieces known to be of Venetian workmanship, and it was no doubt from the great lace-making countries of Flanders and Italy that these valuable laces were brought. From the unfinished piece of lace , made in the eighteenth century, at Freiburg, it will be seen that elaborate needle¬point of typically Italian design was occasionally made outside Venice by private workers. In point de Venise a reseau, a delicate type of Venetian needle-point, the design, unlike that of rose point which rarely varies from its variations on its highly ornamental flower, shows conventional tulips and pomegranates. 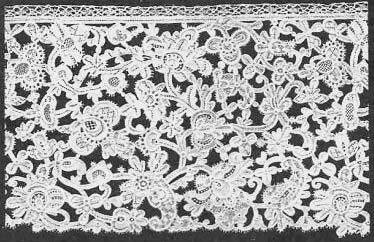 This type of lace is chiefly distinguished by the conventional treatment and arrangement of the ornament, and by the general flat look of the work, by the outlining thicker thread or cordonnet stitched to the edges of the pattern and worked in flatly, by a minute border to the cordonnet of small meshes which intervenes between it and the reseau, and by the horizontal appearance of the reseau, which is of square meshes composed of double- twisted threads throughout, and very fine. The pomegranate motif, so frequent in heavy rose point, reappears ; but the crest of the fruit is elaborated into a scrolling leaf. In other specimens a French influence is apparent in the larger number of open modes, in the ribbon motif crossing the design, the spacing of the ornament, and the cordonnet which is worked around certain flowers, and the more broken outlines of the ornament. The work of these grounded laces is always flat; but in some pieces minute raised button-hole stitched rings are added. Compared with this type, Brussels could not reach the high standard of Venetian workmanship, being forced to content herself with a frequent use of modes more open than the fine close modes belonging to the Venetian point a reseau, which are in general bar, chevron, trellis, and chequer pin-hole patterns, such as are found in the raised points. Variety of effect is obtained by the use of barring (or honey-comb grounding) inserted amongst the stems and leaves of the sprays ; but very open modes, as a general rule, are used sparingly, like " high lights " upon a picture. The style of Venetian a reseau is less floral and more conventional than in Brussels ; and the cordonnet of Brussels straggles. From this grounded point certain details of fine Alencon appear to have been borrowed. Alencon differs from grounded Venetian point in design. Whatever France touched became French. Naturalistic imitations of flowers, birds, vases, and other material objects are freely interspersed in the more ornamental portions of Alencon, while in Venetian lace there is rarely any change from purely conventional treatment. Alencon also differs in workmanship from Venetian point in the raised and continuous outlines to the ornament. Lighter and more open decorative modes are introduced in Alencon ; the reseau rosace is more freely used as a groundwork ; the reseau of grounded Venetian point is square ; that of Alencon is hexagonal and in some specimens certain details are outlined with a thick thread stitched along the stems, leaves, and flowers. The introduction of the thick thread, to give stronger definition to some of the forms, is, however, unusual in this make of lace. less fine ; the horizontal waved lines of the reseau are more irregular and marked in Alencon ; the foliations in point de Venise a reseau are marked by minute regular open-worked fibres or veinings. In general appearance, according to Mr Cole, the designs would seem to give a date somewhere about 1650, that is, at the time when the raised points were largely in circulation. Upon the establishment of the Points de France, in 1665, the French were diligent under the tuition of their Venetian workers in their attempts to imitate. Upon this the skill and invention of the Venetians perfected the point a reseau—an attempt to win back the custom the French manufacturers were taking away from them. Here their labours culminated. As Alencon rose this type of lace declined. " Hence it is that point de Venise a reseau, having probably had but a short existence, died out soon; comparatively few specimens of it are to be seen." At the beginning of the eighteenth century the lace industry was already declining. In 1734, French, Flemish, and English laces were sold at cheaper rates in the Venetian lace shops than the local production. In 1750, Benedetto Raniari and Pietro Gabriele attempted to " improve" the lace industry by imitating Flemish and French laces, especially blonde. They were exempted from taxation for years by the Senate, and their enterprise succeeded from the commercial, if not from the artistic, standpoint, as is proved by their prosperity in ,1758. The old Burano laces are a coarser outcome of the point de Venise a reseau, and alone of all the Venetian needle laces survived the dark days of the close of the eighteenth century. Marini quotes from a document of the seventeenth century in which, speaking of merletti, it is said that " these laces, styled ' punti in aria,' or di Burano, because the greater part of them were made in the country so called, are considered by Lannoni as more noble and of greater whiteness, and for excellency of design and perfect workmanship equal to those of Flanders, and in solidity superior." Very little is known of the early history of Burano lace. Peuchet* writes that a great number of fisherfolk in the island of Burano, as well as people in Venice itself and in the convents, were employed in lace-making ; but that their profits were small. The thread, he adds, comes from Flanders, as the local flax thread was not so strong when equally fine. In 1793 the Gasetta Veneta refers to Burano lace, " del quale si exercitava largo commercio anche nei vecchi tempi." The designs of old Burano, like those of Venise a reseau, are distinguished by a conventional treatment of the flowers and ornament; but the designs are somewhat thinner, there is more reseau in proportion to the pattern, and in some specimens there are semes upon the ground, as in French laces of the Louis XVI. period. In a description in a letter written in 1875, of certain Burano laces in the possession of Sir Henry Layard, specimens were described as "exactly like Alencon," the only difference perceptible being that "the flowers are matted and thick, and very clumsily put into the ground." In an account of Venetian lace-making, written by Urbani de' Gheltof, published in Venice, and translated into English by Lady Layard, a very detailed description, accompanied by diagrams, is given of the mode of execution of Burano point. From this it appears that it is usually worked on a pillow, not, however, of course with bobbins, as for bobbin lace, the object of the pillow or bolster is merely to raise the work to a suitable height on the lap of the lace-maker, and to diminish the necessity of much handling. On the middle of the upper side of the pillow there rests a small wooden cylinder across which the parchment pattern is stretched, leaving an open space under it for the convenience of the worker; thus the strip of lace is kept smooth and flat. In working the reseau ground, a thread is fixed straight across the whole width of the lace as a foundation of each row of meshes, being passed through and fastened to any sprig or part of the pattern which may intervene, and on this thread the looped meshes are worked. The result is the formation of a remarkably square-shaped mesh, and by this and also by the streaky and cloudy appearance of the reseau (owing to the bad quality and unevenness of the thread), Burano point may be recognised. The cordonnet is, like the Brussels needlepoint, of thread stitched round the outline, instead of the Alencon button-hole stitch over horsehair. In 1866 the industry was extinct.."